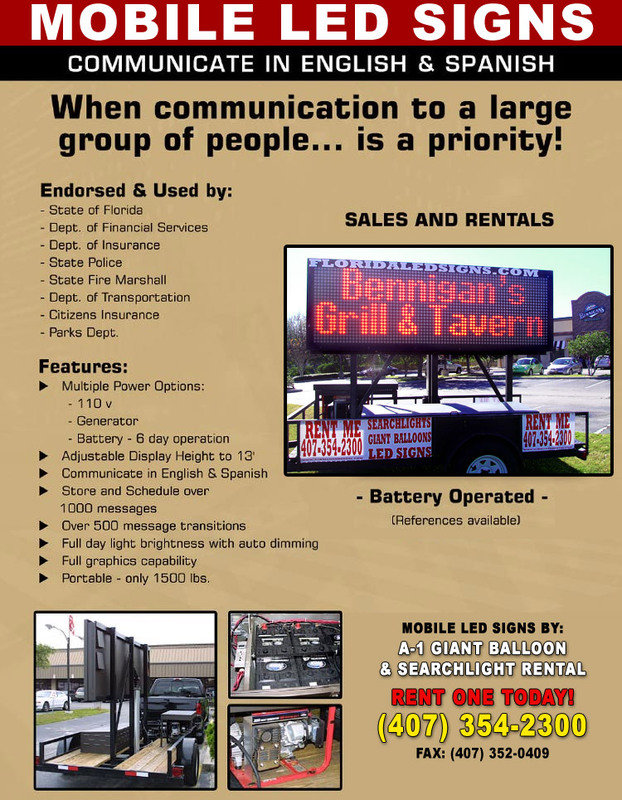 Florida LED Signs: Buy or Rent Mobile LED Signs in Florida. L.E.D. Message Centers, Animated Electronic Signs Rental. Advertising LED display, Video Displays for grand opening, sale, convention, show or event. Help you advertise your new business or existing business. Rental or Purchase our eye catching signs and start increasing your profit potential today! Searchlight rental available with our sister company: Florida Spotlight Rental. Hurricane emergency signs. Serving: Orlando, Jacksonville, Miami, Tampa, Saint Petersburg, Clearwater, Largo, Hialeah, Ft. Myers, Fort Lauderdale, Tallahassee, Hollywood, Pembroke Pines, Sarasota, Gainesville, Kissimmee, Lakeland, Brandon, Valrico, FL. LED sign rental in other Florida cities are available. Call us today: (407) 354-2300 and rent electronic L.E.D. signs & displays at affordable rates.